it did not allow any freedom of the vertebra. 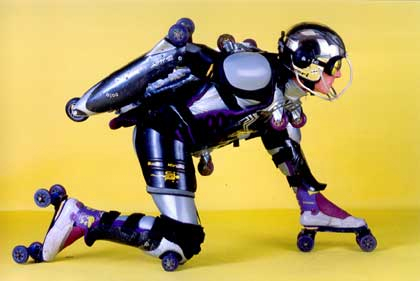 Special skate were used with one pair of wheel on the top of the toes. 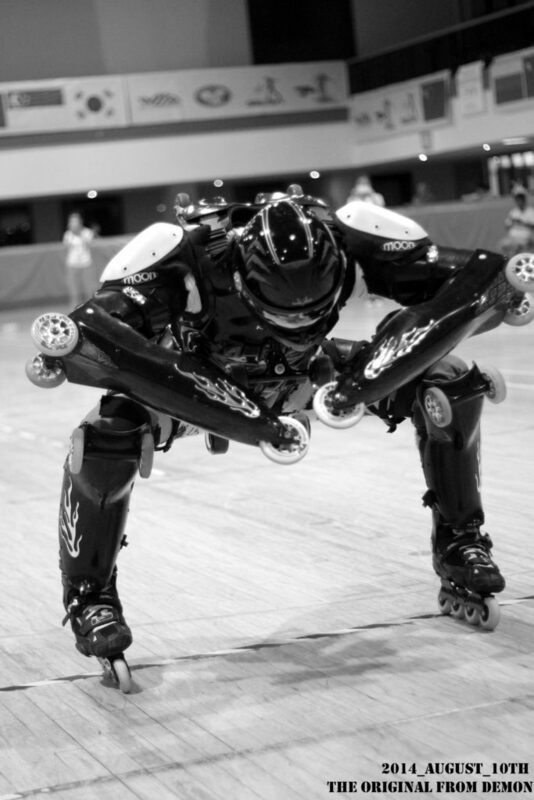 The lesgs were articulated on the skates. The shape of the legs have been thermo formed directly on JY’s leg. The trousers were smoking ! There were only 3 wheels on the back which was lack of stability. for the member producing locomotion and feedback surface information. Black > arrows are feeback. The system of locking the busto have been redesign. The connection with skates has some sliders. The shoulder will be protected. Some new 4wheels skate are going to be designed. multisize setable, trustable in every situation. It will be the moto of all the evolution. High jump (on mat) 5m70. it could go inbob track in 1998 and half pipe. The breast cup were concieved by a woman underwear designer. The shape is more enveloping than the man. it has Air cooling ssytem who reminds corseterie that vehicule strong woman identity. with more efficiency. The chest was sculpted on the technic used by the armors of the great roman soldier. arms and legs are less huge and has more fluid shape to increase dynamics. Axes has better steel. All best and back can be exchanged. The woman chest have also been preserial moulded. This was a dream from the beggining. it has a special expensive metal treatment which provide miror surfaces. Even the plastics parts have been custom made with miror material. Every metal part have been polished with love. But the surface were extrimely fragile, always handle the suit with gloves in order to not let finger prints and scrapes. the suit have been loved by korean media, and abused on every single event. Le père noël est BLEU et il a des ROULETTES ! claus in Seoul on 24 dec. It was made to replace the silver metal. But we could not find the same technology in south korea. so it have been grey painted. We made a special Metal grey with more metal in the paint than any other before. When the chest was mounted with the lastest Gyro 110 Mercury frame, people said that the suit will not be able to curve. WRONG ! 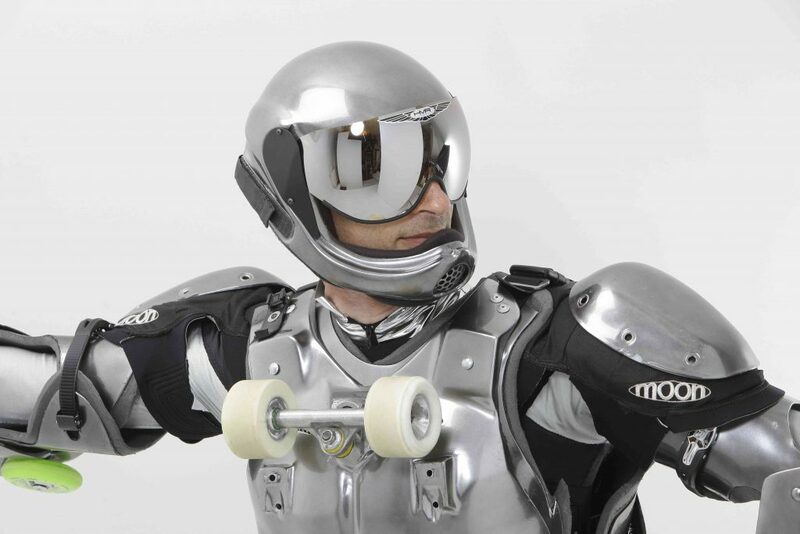 This suit turns like a formula one: flat on rails. It is incredibly stable and allowed higher speed. During many years people were asking Jean Yves “why don’t you go on snow?” He had plenty of time to think about during the long travels between Germany and France. The idea could grow up, and the solutions could be theoretically found. One day as he was in south korea, he could get the opportunity of getting a donation of skis, snowboard and boots. So it was the kick start. Jean Yves Modified a set of shell that was designed to receive wheels into shell that will receive skis. 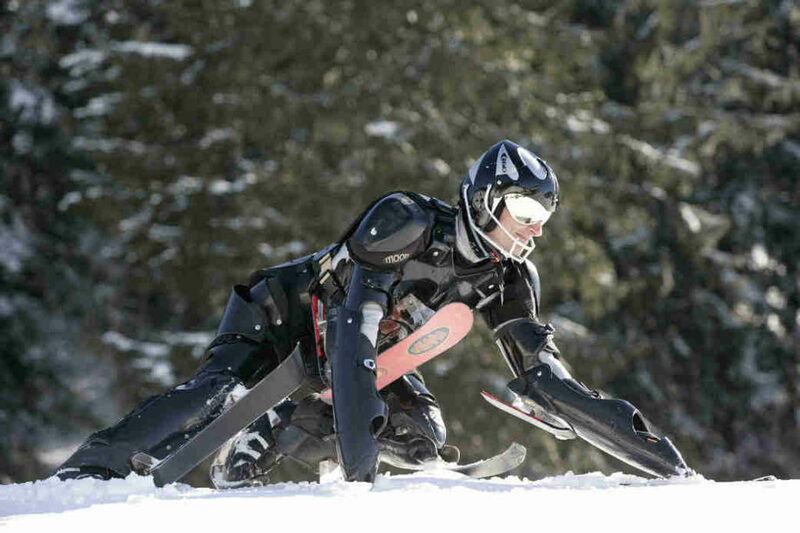 First test was made in Busan South Korea on a sledge slope in December 2005. Then he came back to France to solve many small concept trouble. Made several tests in the alps. At the end of march he could make first interview , video, and photo shooting with Christoph Lebedinsky. 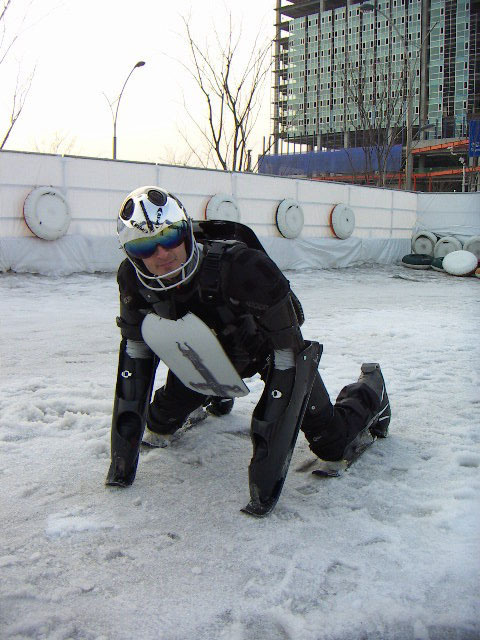 The next day, Jean Yves returned to South Korea with the BUGGY SKI suit. 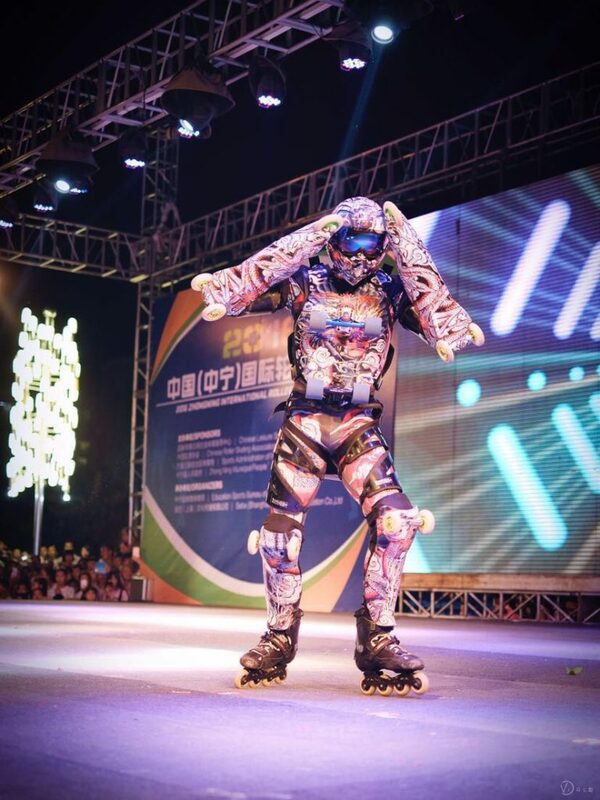 And the following winter he spent his time making show every night in MUJU Resort with BUGGY SKI, giving interview and making TV shows every day. At this time we produced a lot of video with Yvon Labarth, and sometimes with Ji Ha from SKIATE. 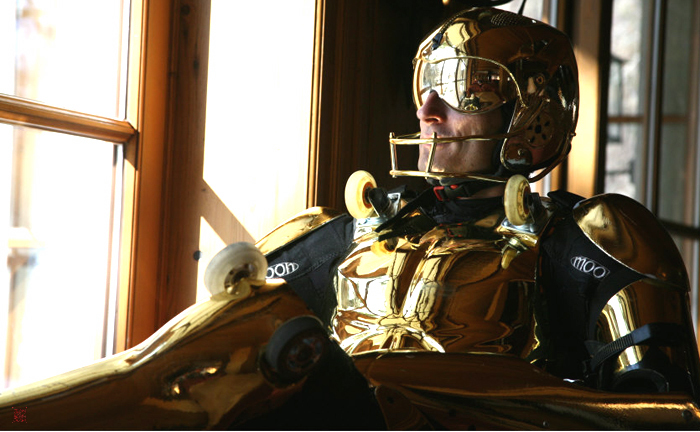 As Jean Yves was riding the slopes, the giants screens were displaying BUGGY SKI videos. Awesome ! Korean agent Kim Nam Hoon thought that it would be good to have golden suit for asian market like china or thailand. with double layers of carbon evry where maybe able to resist 7G. It is so strong that it also may be bulletproof. Stronger but also heavyer which is a non sense for dance on life show. 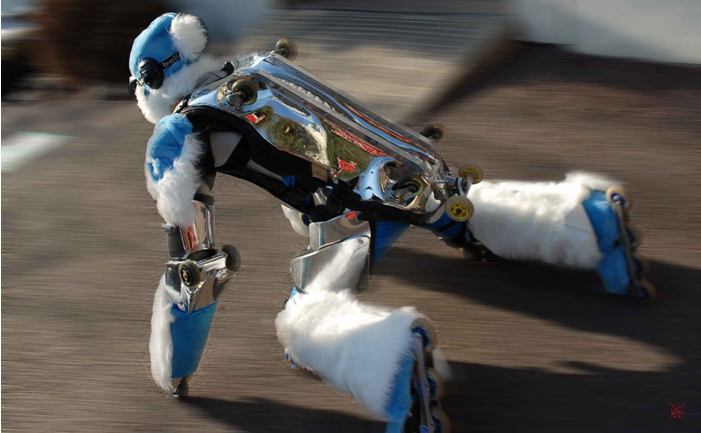 It has very high speed wheel on the chest with secret bearings from japan grippy wheels on the knees foe hard braking and precision grip wheel on the toe. JY is wearing the pterodactyle special helmet from speed record attempt. There is also soft aerodynamic back without wheel. 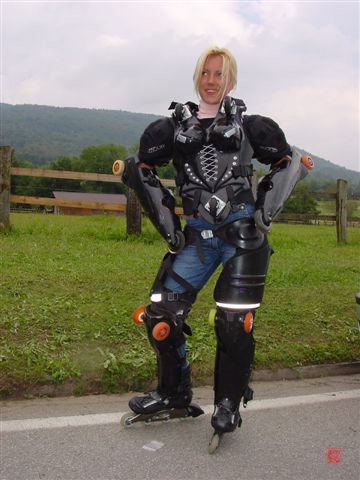 american hip knee and shoulder pads. The chest has no wheel. 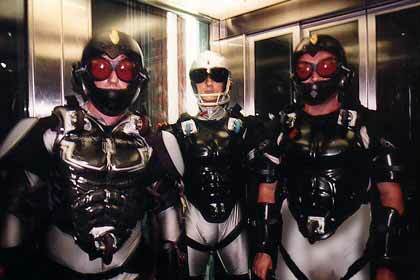 they are derivated from the record suit back, because jim did not plan to roll on the back in his movie. It have been assembled in hollywood under the supervision of Jean Yves. 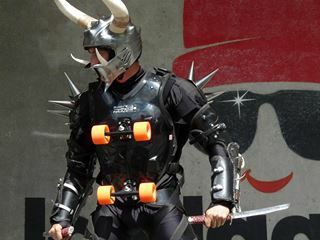 Enough from being always gentle, in cooperation with TATIANA WARNECKE from Berlin, Jean Yves Blondeau decided to create a dark version of BUGGY ROLLIN knights on wheels. Nillor who has its own facebook page is absolute free do act and like what he wants. 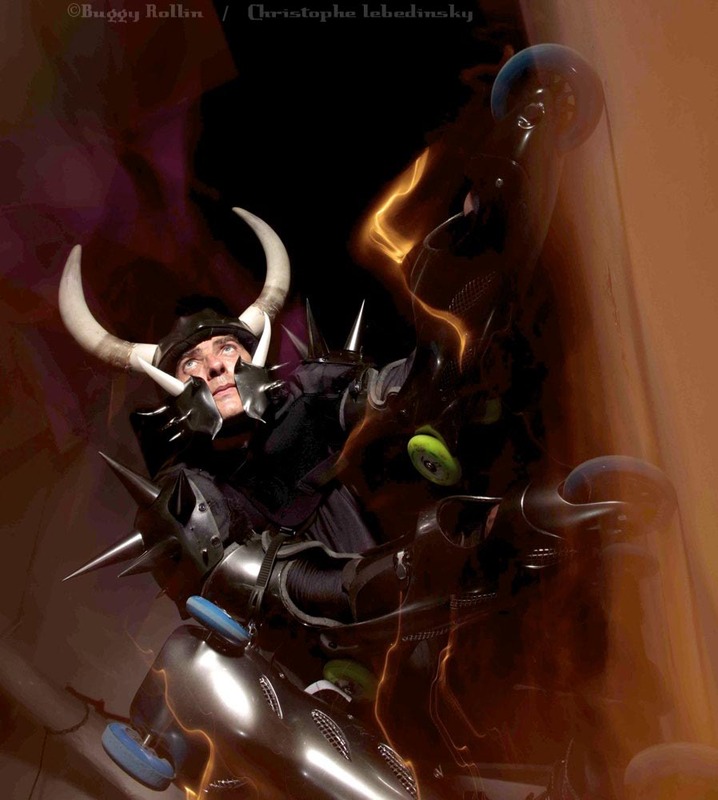 He has spikes all over the armor, it has a helmet with real horns, and arms with integrated katanas. 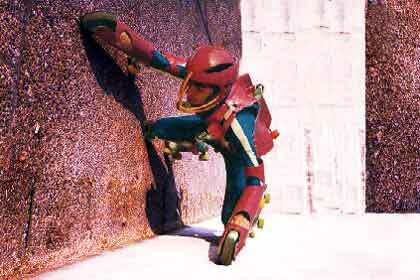 This suit took 4 years to be concieved and build. It is the expression of what a serial production sut should look like. It has many upgraded features. The comfort is increased, the setting possibility is higher, allows the pilot to test his own wheel combination concept. Best allied steel is used for axes. Wheels get faster. Locking system is easyer to use. This suit has been choosed by a famous chinese actor for his movie. 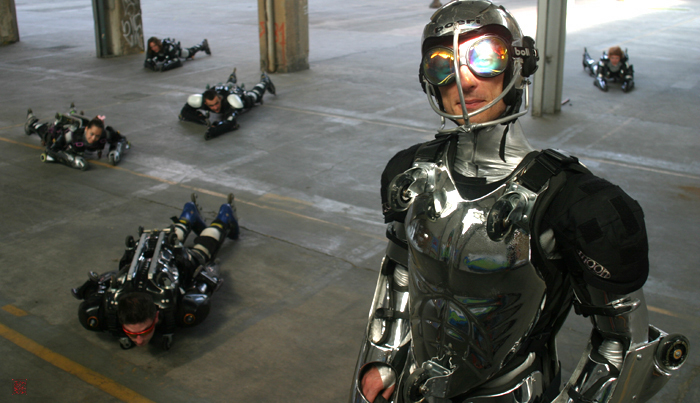 After Jackie Chan decided to include BUGGY ROLLIN in his movie CZ 12, we had to build 2 identical suit for the need of the stunts. Always inprovings prototypes, we decided to put in mould every progress we made. The 2015 Dragon serial includes upgraded axles positioning that enable the user to have the right motion at the right time. It also integrate the shark back. 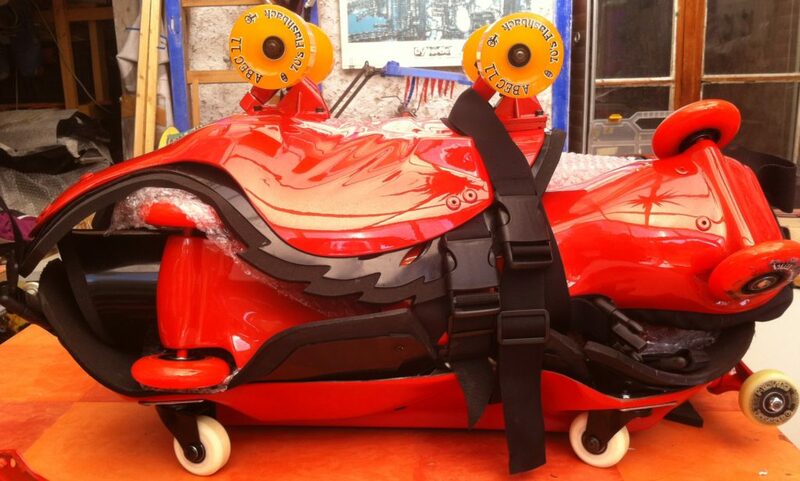 the chest definitively integrate the multi wheel possibility of customize setting between longboard-luge or inline skate rolling trains. A new woman chest has also been developed integrating all the progress of the last years. A special Jung Kyung Ae suit has been built with its own special back and particular webbing. 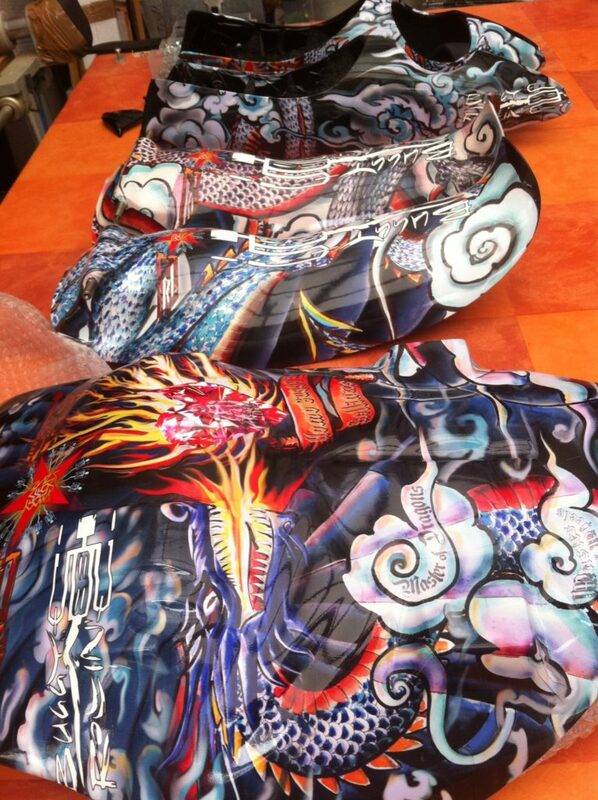 the chest has been completely hand engraved i a research of japanese kimono all over motifs and tattoo spirit. 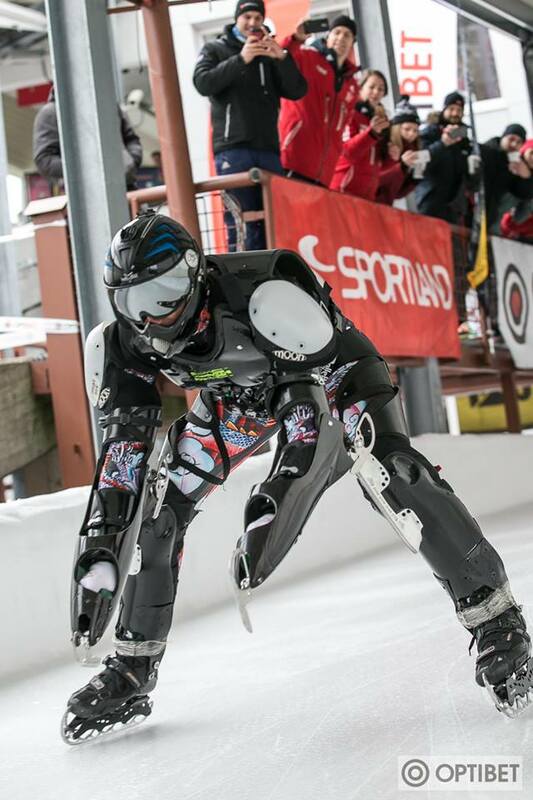 In order to go to bob track in winter on ice, Jean Yves Blondeau designed special blades that goes on a buggy rollin suit. since several years, he was thinking about how to go on ice. With the help of Greg Pinto of FR skates who supplied ice blade adaptors the solution could be achieved. Tests had been made on ice ring to improve the designs and then directly on bob track in sigulda. 9 is the strongest number in china. This number was reserved to the emperor, as well as the dragon was his symbol animal . Jean Yves Blondeau wanted to design a suit that express his spirit with dragons dancing in the clouds, a heart on fire, a shining lucky star. 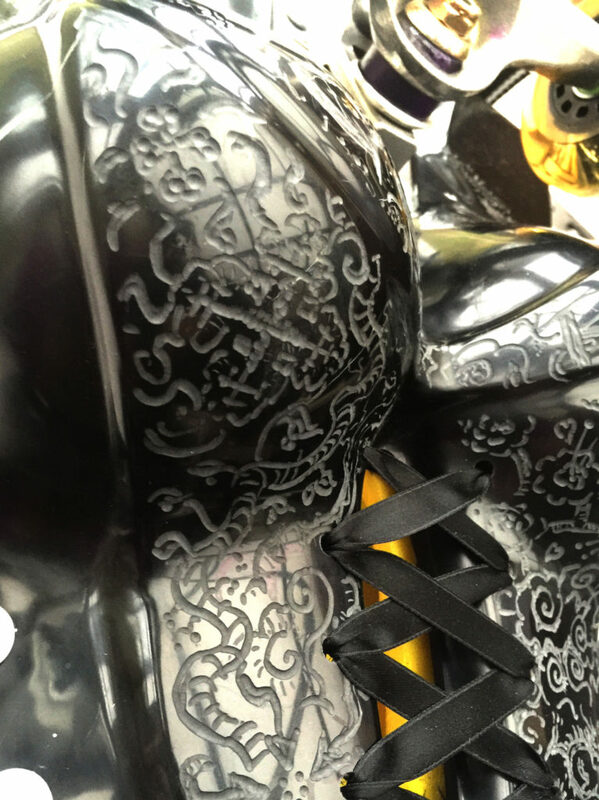 He wanted to mix tattoo asian vocabulary and messages in gothic polices that we can see on west gang skins, with a real deep meaning. some message are in latin, in german, chinese, japanese, and in english. the design of the undercut goes in coherence with the armor, so that the dragons goes outside and under the shell. Xiao Long ordered a suit with his favorite color, in a appropriate smaller size. And the Guillou suit is a test for simplified arms that fit many more size difference. The orange multilayer paint job has been made by Greg owner of Aix T tic car paint. 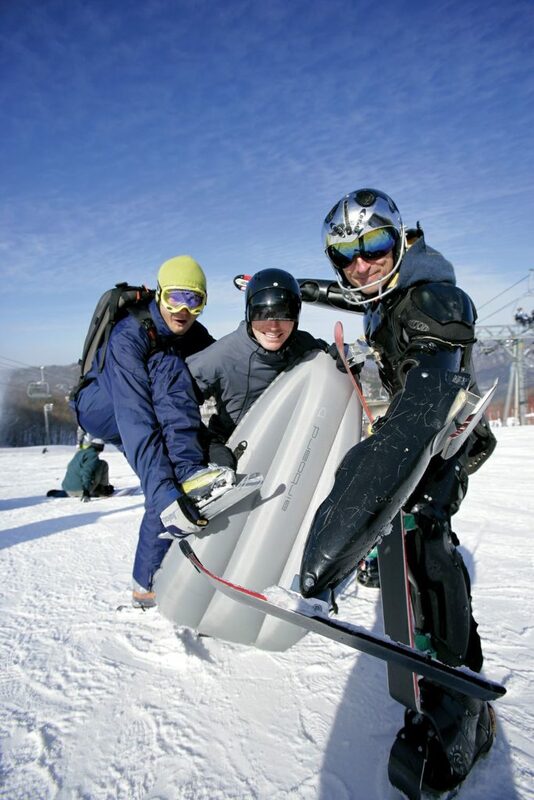 The purpose to BUGGY SKI serial is to bring people together on snow for lessons of buggy ski and later be able to propose suit on sale. New specific moulds are needed to positional the skis in the right place. As been asked since many year, we are going to make a serial for 10-12 years old, considering that from 14 years old a S size adult suit can fit. This is the gate to mass production dreamed from the beginning by Jean Yves Blondeau.